For today’s Meatless Monday, I am sharing 2 recipes from Yup It’s Vegan that look full of flavor and easy to make! 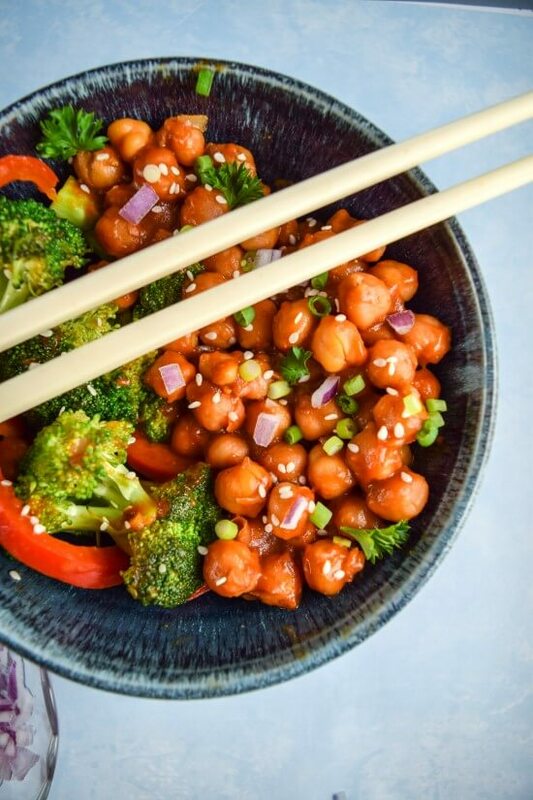 Stir together the soy sauce and mirin in a bowl and add the chickpeas. Let sit for 10 minutes (Do this first and let them marinate while you prepare the sauce and veggies). Whisk together all of the sauce ingredients and set aside. If you plan to garnish your dish with extra diced red onion, put the amount you want for garnish in a small bowl with cold water now. This will help to mellow out its flavor. Heat oil in a large skillet over high heat. When the oil is hot, add the onion, stirring continuously. Continuing to stir, add the broccoli, bell pepper strips, ginger, and garlic. Stir in the General Tso’s sauce. Drain the chickpeas and stir them in too. Cook for 1-2 more minutes, continuing to stir frequently, or until the mixture is hot throughout and the sauce has coated the chickpeas and vegetables. Add more soy sauce or chili sauce to taste. Serve over rice if desired; garnish as desired with green onions, sesame seeds, and drained soaked red onion from above. If your pan is large enough, you can keep the vegetables and chickpeas separate by pushing the vegetables to one side of the pan before you add the chickpeas. For this recipe, it’s important to do all of the prep work before you start cooking anything because you need to be stirring the whole time. Preheat the oven to 400 degrees Fahrenheit. Spray a glass baking dish lightly with oil. 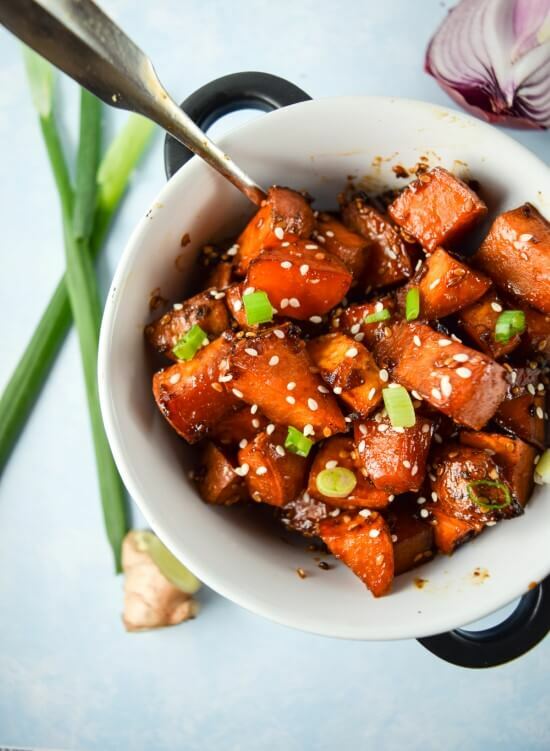 Toss the sweet potatoes with about 1/4 cup teriyaki sauce, or enough to coat them fairly generously. If using, also add the sriracha. Transfer them to the baking dish. Bake until the sweet potatoes are tender but not overdone, about 40 minutes. Stir them a couple of times during baking. Top with green onions and serve hot. Looking for a healthy, easy, one skillet meal? Try this chicken recipe from Paleo Grubs! Cook the bacon in a large skillet until crispy. Remove to a paper towel-lined plate and crumble. Set aside. Discard the bacon fat from the pan except for one Tablespoon. Add the onion to the pan and sauté for 4-5 minutes until soft. Push the onion to one side and add the chicken to the pan. 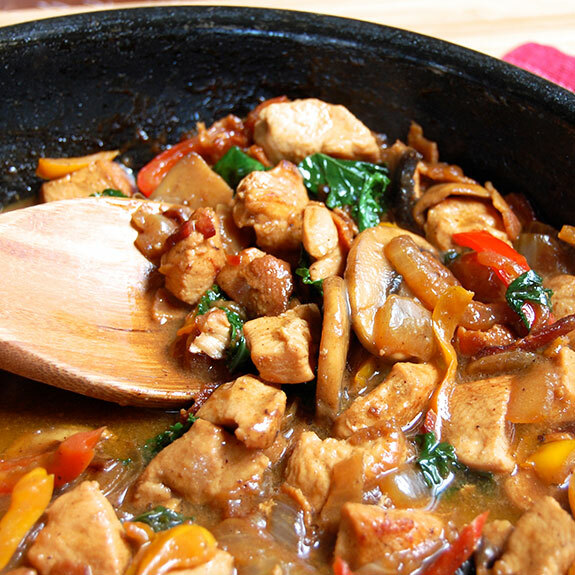 Lightly brown the chicken, and then stir in the bell peppers and mushrooms. Cook for an additional 5 minutes. Stir in the bacon. Add the white wine vinegar to the pan to deglaze. Add the coconut milk and kale. Cook for 3-4 minutes until the kale is wilted and the sauce is slightly thickened. Season to taste with salt and pepper. 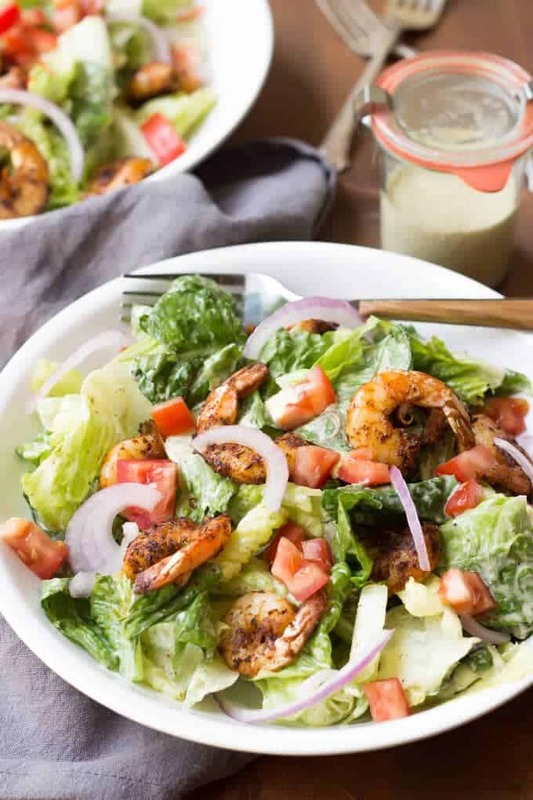 Try the Wicked Spatula’s twist on Caesar salad for a great light summer supper (or lunch)! In a blender combine all ingredients except for the oil. (can also use an immersion blender). Once combined pour in the oil, while blending, in a slow steady stream until emulsified. Season with salt and pepper and any additional lemon if needed. In a medium bowl combine all of the spices. Peel and devein the shrimp and pat them dry. Toss the shrimp with the spices. Heat 3 Tablespoons of olive oil in a large skillet over medium-high heat. Place the shrimp in the skillet in a single layer. Sear for 1 minutes until they begin to blacken. Flip and sear another minute or so until the are cooked through. In a large bowl toss the chopped romaine with the dressing. Divide between 4 plates and top with shrimp and chosen toppings. Serve with an extra crack of black pepper. This recipe from Eating Well is healthy, tasty, and can be on the table in 30 minutes! Whisk 1 tablespoon oil, lemon juice, garlic, and a pinch each of salt and pepper in a large bowl. Add arugula and toss to coat. Peel and devein shrimp, leaving the tails on. Pat dry and sprinkle both sides with the remaining pinch of pepper. Wrap 1 piece of prosciutto around each shrimp. Heat the remaining 2 teaspoons oil in a large nonstick skillet over medium-high heat. Add the shrimp and cook, turning once, until just cooked through, about 4 minutes total. Serve the shrimp with the arugula salad. This recipe is a get post that I found on PaleOMG, the author is Ali Mafucci from Inspiralized. 3 chayotes, spiralized with the blade resembling linguine or spaghetti noodles. If you don’t have a spiralizer, you can use a julienne peeler or a mandolin slicer. Make the albondigas. Preheat the oven to 375 degrees. Line a baking sheet with parchment paper. Combine the ingredients for the albondigas in a large bowl. Using your hands, form 8 to 10 meatballs about 1 inch in diameter and space them evenly on the baking sheet. Bake for 18-20 minutes or until browned, flipping them halfway through. Prepare the sauce. Add the olive oil to a large saucepan or pot over medium heat. When the oil is shimmering, add the garlic and cook for 30 seconds or until fragrant. Add the onion and chile, and cook for 2 to 3 minutes or until the onion is translucent. Add the tomatoes, season with salt and pepper, and crush the tomatoes using a potato masher or the back of a fork. Increase the heat to high and bring to a boil. Add the cilantro, reduce the heat to low, and simmer for 10 to 15 minutes or until the sauce thickens, stirring occasionally. Add the meatballs to the sauce and continue to simmer, turning to coat them, for 1 to 2 minutes. Scoop out the meatballs and set aside, then add the chayote noodles to the sauce. Toss to combine thoroughly and cook for 3 minutes or until chayote noodles are al dente. Serve the noodles warm, topped with the meatballs, and with any extra sauce spooned over. *Some people experience a skin reaction when handling chayotes and other cucurbit family foods, which includes squash and pumpkins. If you don’t want to take any chances, wear gloves when handling. Damn Delicious has a recipe for beef and broccoli that you can make in 15 minutes! No, it’s not Paleo but it’s quick, easy, and easy to make Paleo if needed. In a medium bowl, whisk together soy sauce, chicken stock, honey, vinegar, brown sugar, garlic, sesame oil, cornstarch, Sriracha, ginger, red pepper flakes and 1/4 cup water; set aside. Heat olive oil in a large skillet over medium high heat. Add steak and cook, flipping once, until browned, about 3-4 minutes. Stir in broccoli and soy sauce mixture until tender and slightly thickened, about 3-4 minutes. This recipe from The Kitchn is full of flavor, healthy, and sure to please everyone at your table! Serve over rice with fresh cilantro sprinkled over the top of each serving. The tikka masala can be refrigerated for 3 to 4 days or frozen for 3 to 4 months. Chicken breasts can be substituted for the thighs, though thighs hold up better over the long cooking and breasts tend to fall into shreds. Still delicious, though! For a little of that smoky, tandoori flavor, try using smoked paprika and roasted tomatoes. The Garden Grazer has an easy peasy recipe for Greek salad that is perfect for a small meal or a side dish. Make the dressing: in a small bowl, combine all ingredients and whisk to combine. Set aside. Dice the cucumber, onion, bell pepper and tomatoes (removing any excess liquid from tomatoes). Put vegetables and garbanzo beans in a large bowl. Add dressing and toss to combine. Can eat immediately or refrigerate for at least an hour to let flavors combine. Some dressing will settle on the bottom, so stir before serving. In a large skillet, heat half of the olive oil and sauté the diced onion, pepper, celery, jalapeños, and garlic; remove when tender. In the same skillet, heat remaining oil and brown meat, 1⁄4 at a time as to cook evenly; remove when brown. Turn crockpot on low, and add meat, sautéed vegetables, spices, salsa, beans, and all liquid. Cook on low all day, or at least 7 hours.